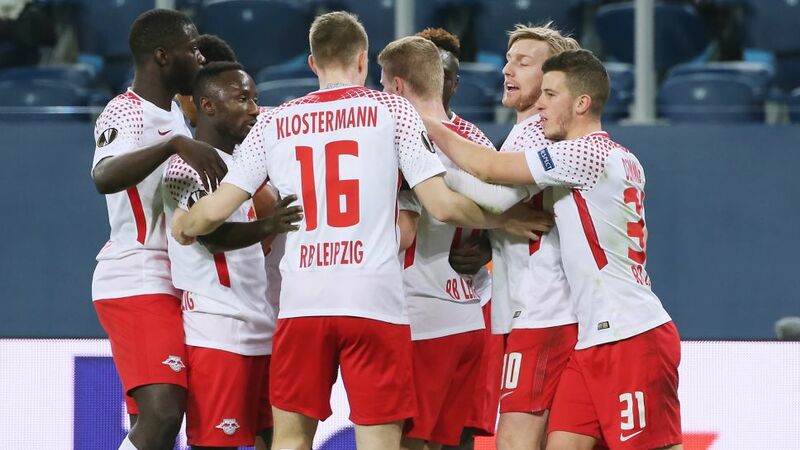 A goal from Jean-Kevin Augustin was enough to secure RB Leipzig a 1-1 draw at Zenit Saint Petersburg and back up an impressive first-leg result as Ralph Hasenhüttl’s side progressed to the quarter-finals of the UEFA Europa League in their very first European campaign. Despite Zenit being the side in need of a goal, Leipzig started the game on the front foot as they pushed the hosts in attack and also limited chances at the back. In fact, it was visiting RBL that scored first when Augustin tucked home following a through-ball from Timo Werner and a tidy turn from the Frenchman in the box to take out the Zenit defence. Leipzig were comfortable for the most part, but the hosts began to up the ante late in the first half. Substitute Anton Zabalotny, who had come on early for injured top scorer Aleksandr Kokorin, looked lively but it was Sebastian Driussi who brought Zenit level on the night in first-half injury time when he put away Domenico Criscito’s cross from the left. Zenit flew out of the blocks following the break again knowing they needed to score to have a chance of progressing, but Leipzig weathered the early storm and then began to threaten themselves. Emil Forsberg, Augustin and Werner all had chances to secure a second away goal and surely put the tie beyond doubt, but they were denied by a combination of frantic Zenit defending and the linesman’s flag. Gaps continued to open up with the hosts pushing forward for that goal they needed to at least take the tie to extra-time, and Leipzig had a huge chance to wrap up the tie when Werner won a penalty with 10 minutes remaining, but the German had his effort saved by goalkeeper Andrey Lunev. Bruma had another chance to put the game beyond all doubt in injury time following a Werner breakaway, but the ball was just too close to the goalkeeper, who could save. It didn’t matter, though, as Leipzig had done enough to progress to the quarter-finals in their first-ever European campaign. They find out their opponents for the last eight on Friday afternoon, before hosting Bundesliga leaders Bayern Munich on Sunday evening looking to put the Bavarians’ title celebrations on hold over the international break. Leipzig have reached the quarter-final stage in their first ever European campaign.Werner has scored five goals in his last four away continental outings for Leipzig.Leipzig became the 204th club to compete in the UEFA Europa League, group stage to final – and a record 17th from Germany – when they transferred over from the UEFA Champions League in the winter.RB became only the second team to avoid defeat at Zenit in the Europa League.Zenit's home record against German teams now reads W2 D1 L6.Zenit defender Branislav Ivanovic was part of the Chelsea side that beat Bayern Munich in the final of the 2011/12 Champions League.